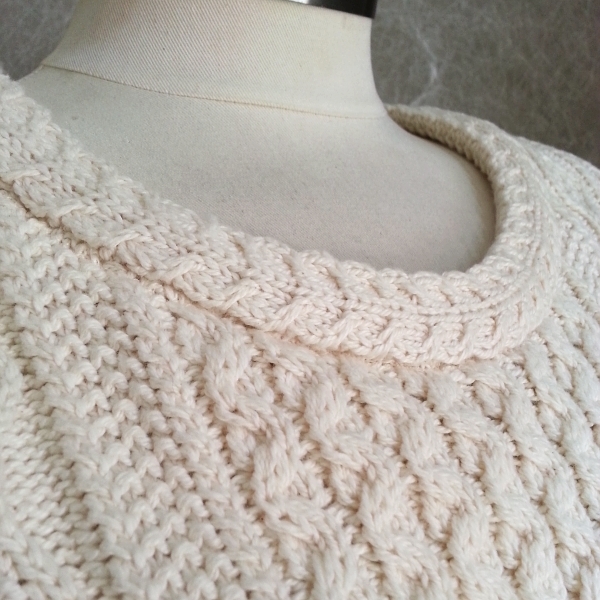 This is the neckline of my new sweater made of fisherman knit panels (sold out). All major pieces for the sweater have been cut out now. I've even started sewing! The pattern I decided to use is Neue Mode 22560, a sewing pattern I started to try out over a year ago. Plans changed, however, and I never completed that test sweater. Neue Mode 22560 is available as a printed pattern (no PDFs) and has no seam allowances (my favorite way to work). It's printed on paper that's more substantial than the usual tissue paper, though the print quality isn't very crisp. 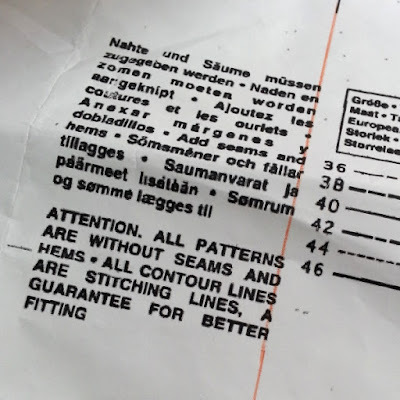 The lines are clear enough, but the words on the pattern pieces appear fuzzy in places. Instructions are not included with the printed pattern; they must be downloaded separately from the Neue Mode site. Info on Neue Mode 22460, orange line is my extension of the grainline. There are certain basic sweater styles where I'll use only major pattern pieces -- the front, the back, and the sleeve -- then make my own choices as to the finishing pieces. This pattern is one of them. I think that if it's a basic sweater, it may be easiest to self-draft the cuffs or any bands or binding. This is especially true if "sweater knit" isn't on the recommended fabrics list of the sewing pattern or if using something other than self fabric for the bands or binding. The best part is that rectangles are usually sufficient for these finishing pieces! And even if sweater knits are listed in the recommended fabrics list, all sweater knits are not the same. Because they vary in weight, stretch, and recovery, it would be impossible for any pattern maker/designer to come up with a sewing pattern that worked well for every knit fabric. 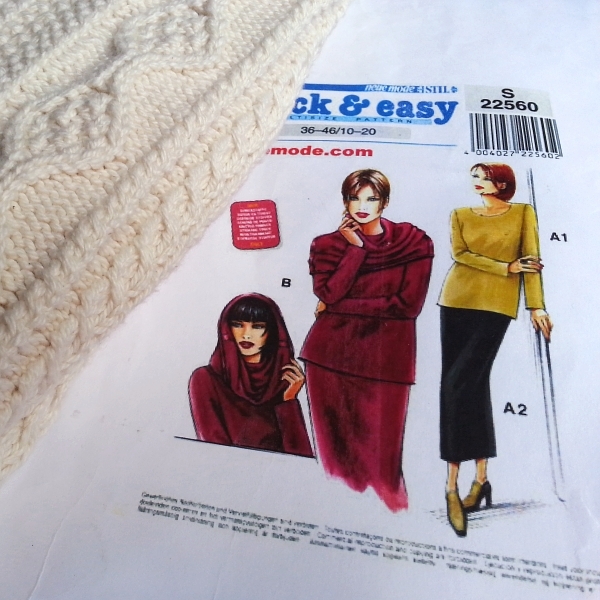 Besides the major pieces, the pattern came with pieces for a facing (View A1) and an enormous collar/snood (View B). View A2 is a skirt. I, however, was inspired by the neckline on this sweater. I cut a rectangle of fabric to include one of the cable motifs from the panel cutaways. 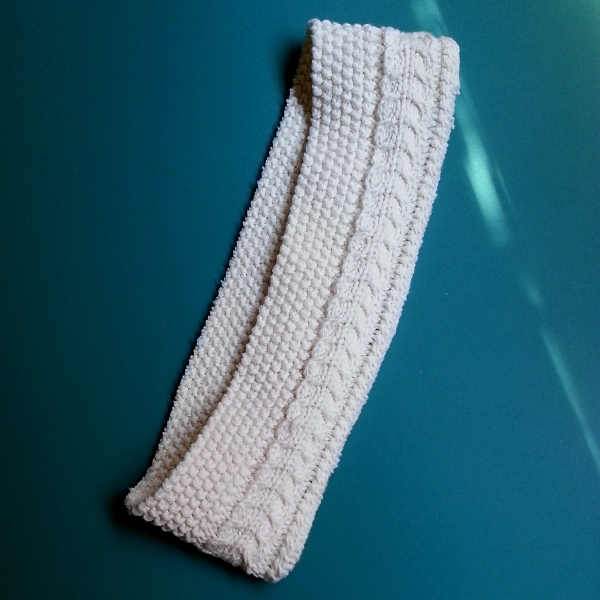 I used the cable strip to enclose the raw edge of the neckline that I'd already lowered by 2 inches in the front and one-half inch in the back. The original neckline for this sweater pattern was much higher on me than it appears in the illustration for View A1. This was my cable strip, sewn into a circle, before I folded it over and sewed it to the neckline. Thank you. I think you'll really like this fabric, Brooke. Enjoy! This is wonderful! I am going to start thinking about a cut and see knit. I've only done one and it fell apart when I washed it! Thank you! I'm glad you're thinking about cut & sew knits again, but I'm quite curious as to why your first one fell apart. Hi O. Jolly! I received the sweater panel today and have read your posts about making this sweater. I'm excited for the possibilities and really appreciate your posts detailing how you made the sweater. Super excited!